Just a salute to Carol L. Thompson and her colleagues at the Allen Institute for Brain Science (Seattle, WA) on their paper entitled, “Genomic Anatomy of the Hippocampus” [doi: 10.1016/j.neuron.2008.12.008] or (email the corresponding author for a copy). This paper (and much of the work from the Allen Institute) could be filed under the lonstanding cry heard among grad students, “if every neuron is connected to every neuron, how will we ever make sense of the brain?” The present paper is an excellent example of how cells within a particular structure – in this case the hippocampus – can be specialized in terms of their structure and connectivity. Not surprisingly, the differences in structure and connectivity are driven, in part, by differential gene expression, which this group has ably made sense of. There are a number of great figures that tell the story, but for me, the $$ shot is Figure 3 showing that their “statistical reduction” analysis of 20,000 unique transcripts in the mouse brain led to the identification and 3D-reconstruction of 9 discrete zones of gene expression within the hippocampus. Further analysis of cell adhesion genes (cadherins, collagens, IgG superfamily) and axon guidance genes (ephrins, slits, robos, semaphorins) showed that these 9 regions differ in their combinatorial expression of these molecules. Thus, the 9 regions of the hippocampus may reflect different zones in incoming (afferent) and outgoing (efferent) neural transmission (they confirm this for CA3 projections to the lateral septum using retrograde labeling). 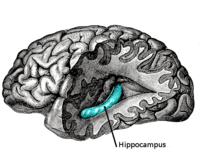 At some point in the future, as genetic associations with memory and other hippocampal functions are identified, it may be possible to use this type of atlas (there is a human Allen Brain Atlas atlas in the works) to better understand what functional subdivisions and therefore, what type of circuitry is involved in individual differences in hippocampal function. A possibility I hope I’ll not soon forget.